We looked at what was happening in Stroud in the 1860s – what was here and what was yet to come – because the church presented a major new exhibition of the HISTORY OF THE PARISH CHURCH to coincide with the 150th anniversary of the opening of the rebuilt church in 1868 (the 14th century tower and spire remain). 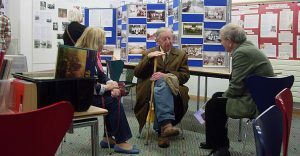 We displayed SLHS members’ research into Stroud’s Public Baths, isolation hospital and mortuary (Liz Wright), 19thC emigration (Marion Hearfield), the Marlings in King’s Stanley and Selsley (Peter Griffin), and the Arts and Crafts movement (Jenny Bailey). Over 150 of Conway’s photographs (1905-1920s) illustrated the Nailsworth/Minchinhampton area (Howard Beard) together with his sinister new tale of Sudden Death in Nailsworth. A display about local poets and writers (Sue and Barry Harrison) helped to celebrate the Stroud Arts Festival’s 70th anniversary and Marion Hearfield’s new book – a history of the old Stroud Brewery (written for SLHS) – was launched. A rolling slideshow about the old brewery gave visitors the opportunity to sit down and a Children’s Quiz (Dave and Pauline Stevens) kept young visitors occupied. Many other members helped to steward the event during the week and answer questions. 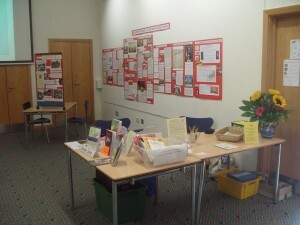 About 600 people came to browse and we were offered useful new stories and photographs. One afternoon, our own Lionel Walrond gave an impromptu seminar on Stroud’s mediaeval roads, and on another afternoon Marion Hearfield ran a workshop on reading old manuscripts. It was a busy week! 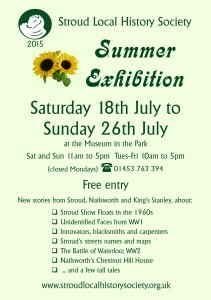 Once again, our Summer Exhibition at the Museum in the Park was a great success. We had 638 visitors during the week, quite a few of whom came back to make sure they saw everything. Fifteen members provided stewarding services between them and Our Visitors’ Book quickly filled with questions, requests, offers and compliments, and many people took away our Society programme. 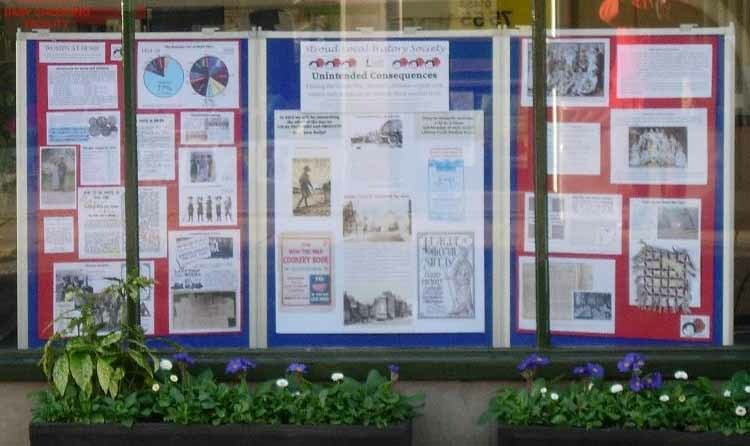 We sold copies of the books published by the Society (and some that weren’t) and featured in the local newspapers and on Radio Gloucestershire. 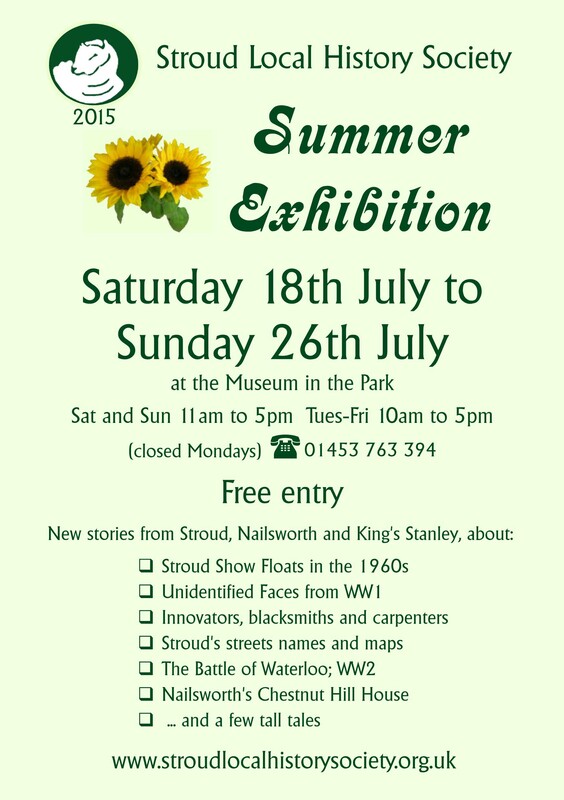 The exhibits were: Farming in King’s Stanley by Peter Griffin, Memories of Stroud during WW2, and Gloucestershire and the Napoleonic Wars, by Sue and Barry Harrison, Streetname Origins by Pauline Stevens, the story of St Rose’s by Jenny Bailey, two displays from our WW1 Home Front research by Marion Hearfield, a number of short stories and tall tales researched jointly during the past year and, in Howard’s corner, three stories by Howard Beard about Chestnut Hill House, carpenter William Beard and blacksmith Henry Pearce – and a display of artefacts from the Pearce family. 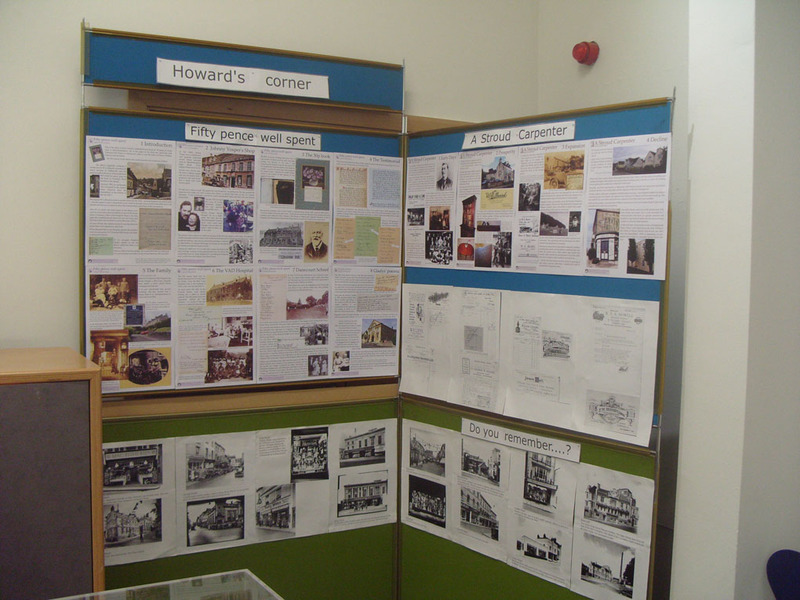 Howard also showed some old photographs of the town in Do You Remember…? 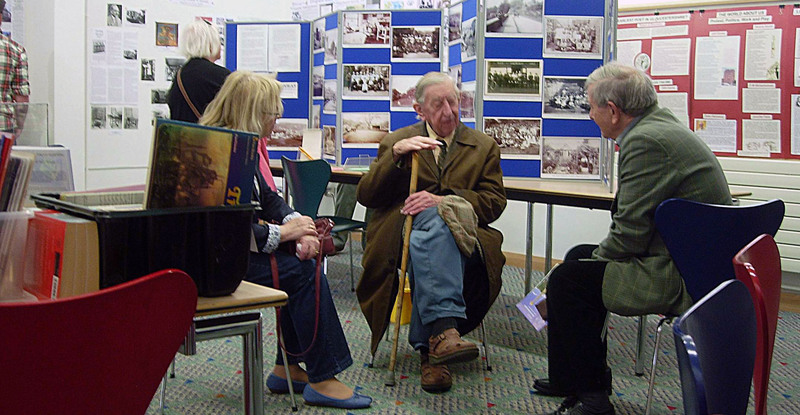 The slideshows – especially Pauline’s Town Quiz and Jenny’s slides of Stroud Show Floats – were very popular and gave visitors a welcome opportunity to sit down and relax. 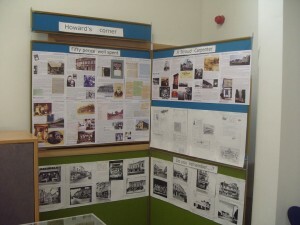 “What riches there are in our town” said one visitor – “what an excellent and informative exhibition”. and glittering ribbons of quotations from his stories and poetry. 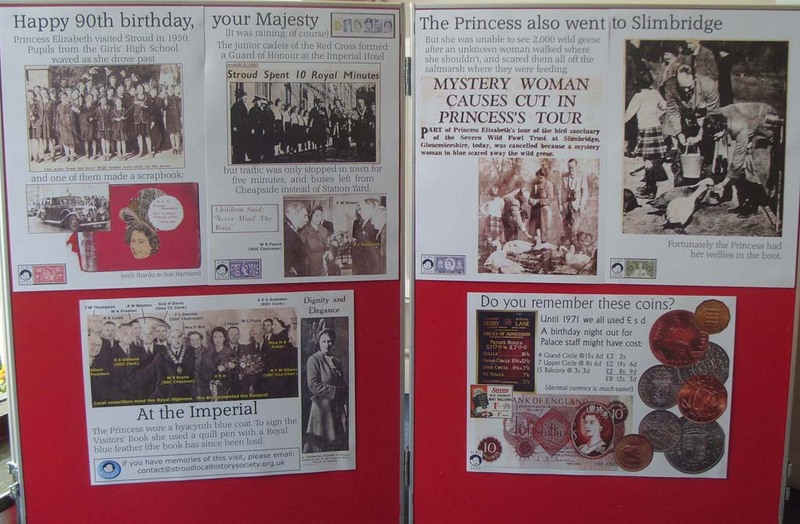 Members Barry Harrison and Jenny Bailey contributed material to the FESTOMANE week of exhibitions and events at the Leisure Centre and Museum in the Park. This exhibition is the first that has resulted from our ongoing research project into the lives of the townsfolk during the Great War. 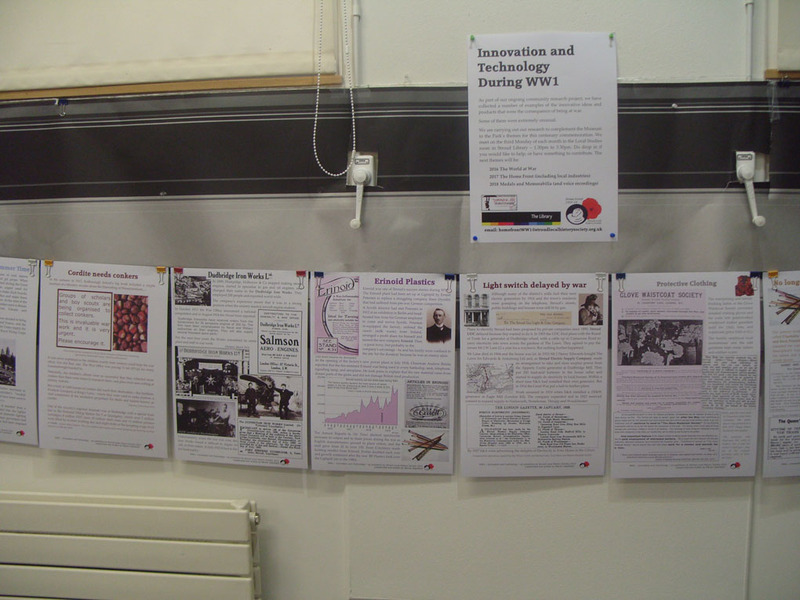 The full display was launched at the GLHA exhibition at Pate’s Grammar School in October 2014. 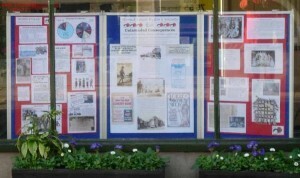 Then a selection went to Stroud and Nailsworth libraries, and another small part to the Stroud Town Council window in January 2015 (photo left). This year we packed Gallery 2 with displays by present and past members covering subjects as varied as holidays and workhouses. 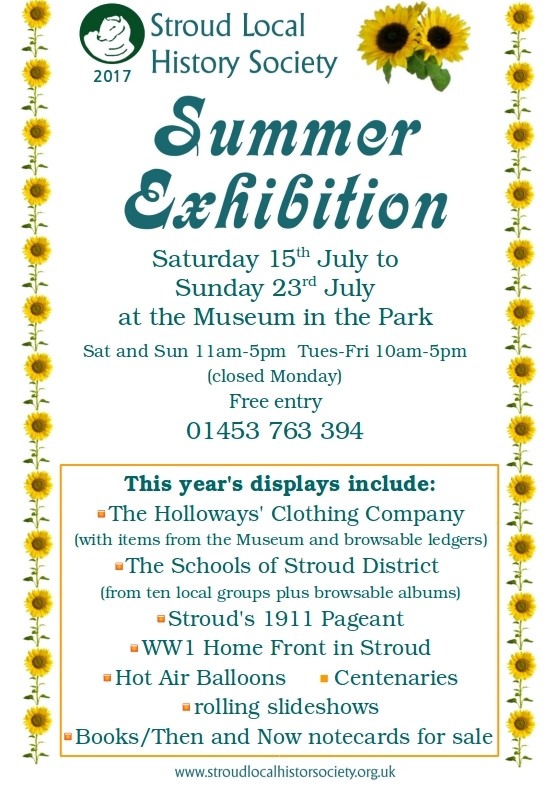 Following the success of the 2013 exhibition the Museum staff suggested that this year we extend the exhibition beyond Stroud Show weekend, and we had over 500 visitors in the 8 days. 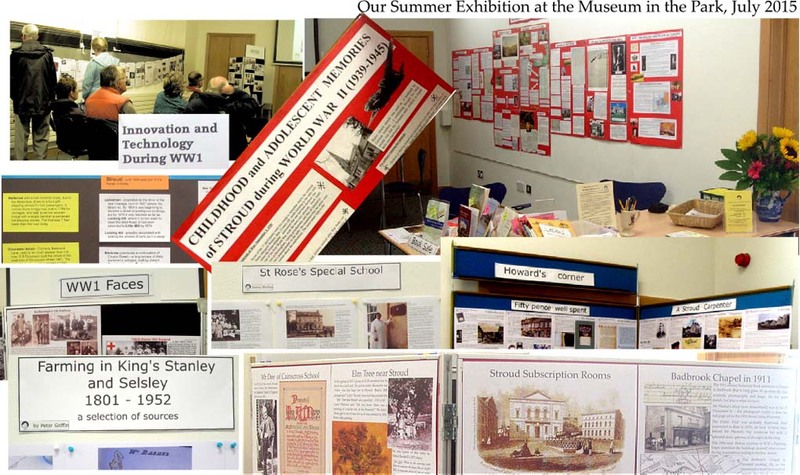 Stroud Local History Society linked in with Stroud Country Show in July by mounting an exhibition of past and present projects undertaken by society members. 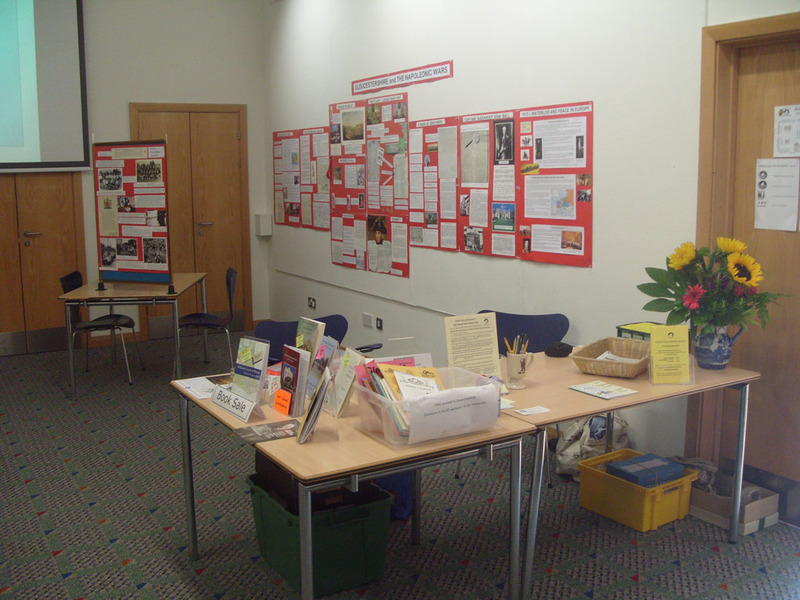 The exhibition was a collaboration of SLHS with the Museum in The Park. Displays were varied. Jenny Bailey’s contribution included a survey of the Summer Street district of Stroud, its history and the story of its community life; also a study of immigration into the area by people of eastern European descent. Susan and Barry Harrison covered Sport in Gloucestershire through the centuries, local connections with the Napoleonic Wars, Railway Reminiscences and the Uplands, Stroud. Barry also had a display about ‘The Man who took Stroud’s Temperatures’ and his research into Thomas Hughes (1742-1813) who was born in Dursley. Thomas Hughes was an apothecary and surgeon who moved to Stroud in 1771, and who kept detailed weather records up to the year of his death in 1813. His weather diaries provide a major contribution to what is known about the climate of the late 18th century. Howard Beard displayed project work, mostly based around early photographs, of local Edwardian events such as the 1907 visit of the County Agricultural Show, the great 1911 Mid-Gloucestershire Historical Pageant of Progress and George V’s Coronation; also pictures from a century ago of Stroud shops and street scenes, together with letterheads and humorous postcards. 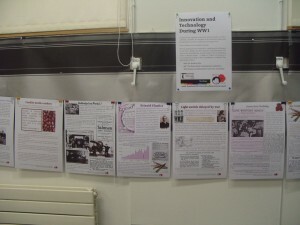 Around 270 people visited the exhibition which appears to have been much enjoyed. 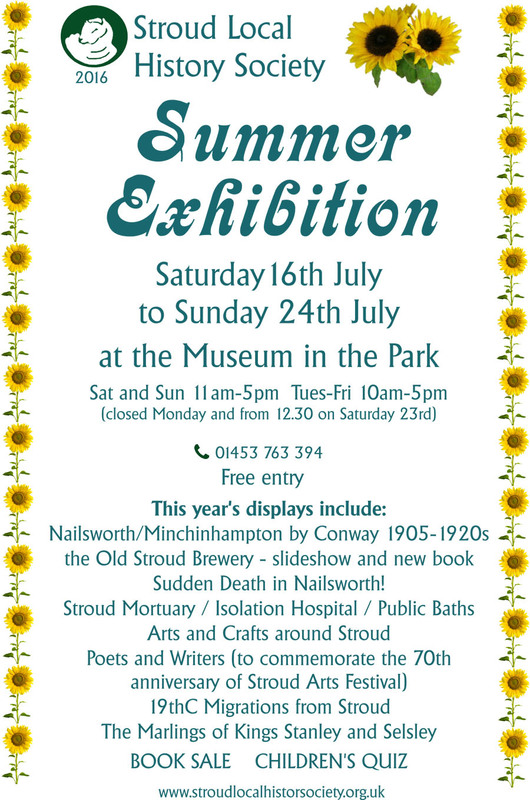 Exhibition celebrating Stroud beginnings and as a separate community since 1304 (many local societies took part). 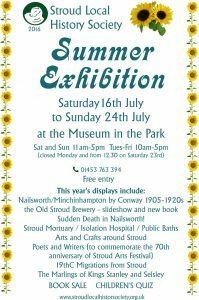 The Stroud 700 Wall hangings are in Old Town Hall, The Shambles. Stroud was granted a Market Charter in 1594 – The Stroud 400 Wall hangings are in Old Town Hall, The Shambles. (Many local societies took part). All content & logo © Stroud Local History Society, unless otherwise stated. All copyrights acknowledged. | Proudly powered by WordPress | Theme: Kelly by WordPress.com.